(UPDATE 8/25/2013) The reason for the ad hoc presser is explained in the new post. The press conference will start at 6PM on August 24, 2013 (Japan Standard Time) at TEPCO's Tokyo Headquarters. Meanwhile, Jiji Tsushin (8/23/2013) has a bit of information on what's beneath the concrete platform on which the huge waste water tanks assembled from steel sheets, bolts and nuts, rubber packing and anti-corrosion epoxy paint stand. Tanks sit on the concrete that's 20-centimeter thick. There is a 1-meter-thick layer of amended soil mixed with cement to make it harder for water to pass through. Groundwater flows at the depth of 5 to 7 meters from the ground surface. Jiji's article is about TEPCO's plan to conduct a boring survey around the tanks. I think this is what Nuclear Regulatory Authority strongly suggested TEPCO to do. NRA's Commissioner Fuketa visited the plant on August 23, and he requested TEPCO to inspect ALL tanks including welded tanks. Given the corrosion and leak from the welded ALPS tanks, welded tanks at the plant may not be so leak-proof. In short, he says the leak of RO waste water from the storage tank(s) happened because TEPCO counted on ALPS, multi-nuclide removal system, too much. Oops. The hot run of the system has been stopped when TEPCO found the leak and corrosion in the stainless steel tanks used in the system. Tanks are assembled with bolts and linings, as opposed to being welded using automatic welding machines like MIG and MAG. Shipbuilding uses automatic welding machines. Why didn't TEPCO use them? It's not the matter of speed [that's TEPCO's excuse] but cost. But if you build a large enough number of tanks you have extra capacities and the cost becomes lower. Why didn't TEPCO do that? It's because all their plans depended on ALPS. If ALPS becomes operational, there will be excess tanks. So TEPCO didn't build tanks more than enough, because it would be waste of money. Welding the tanks would cost more money. However, the incident this time will cost yet more money for decontamination of the tank(s), investigation, and countermeasures. 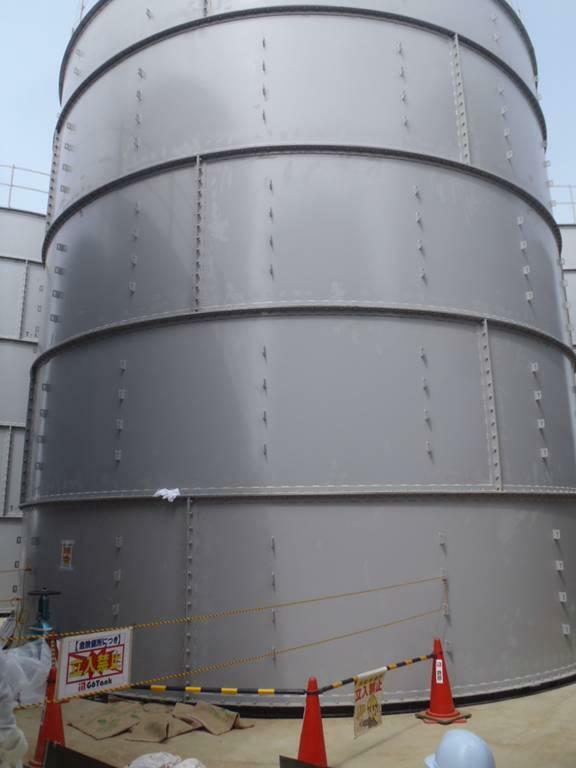 If the tanks were welded from the beginning, TEPCO wouldn't have needed to empty the water, decontaminate the tank(s) and weld. The incident was bound to happen, because of TEPCO's cost cutting measures, their "our plan is always perfect" mentality, their risk management and their lack of knowledge in the field it is unfamiliar with. In other words, it is exactly the same as the Fukushima I Nuclear Power Plant accident. Besides, the incident this time was easily preventable. It is like riding a car without any seat belt, because it is "annoying". The event was open to public, and there were many politicians (including Prime Minister Shinzo Abe, who left in less than 3 minutes, former Prime Minister Naoto Kan, Goshi Hosono, Banri Kaieda) and people who wanted to thank Yoshida for what he had done at the plant after March 11, 2011. According to Toshihiro Okuyama of Asahi Shinbun, former TEPCO chairman Katsumata and former TEPCO president Shimizu came before the official start of the event, dedicated flowers and spoke with the family. Again according to Asahi's Okuyama, over 1,000 people in total attended the event. The photo of Mr. Yoshida for the funeral showed him in blue uniform, smiling. In front of the photo, there were a megaphone and a towel with Hanshin Tigers (baseball team) logo. There was a concerted negative campaign right after Yoshida's death that he had been very reluctant to devise countermeasures against tsunami and therefore he was directly responsible for the nuclear accident. According to Mr. Rhusho Kadota, independent journalist who interviewed Mr. Yoshida right before he was incapacitated by brain hemorrhage in July 2012, Yoshida was the one who had been pushing strongly for tsunami countermeasures at Fukushima I Nuclear Power Plant and trying to obtain hard evidence of a large tsunami to persuade the local municipalities to build a large seawall for the plant. I saw a foreign-looking, Asian father and his daughter walking in front of the ceremonial hall. Daughter: I wonder whose funeral it is. Father: That's Mr. Yoshida. That plant manager who did all he could. They stopped, and quietly put their hands together in prayer. Then they walked away quietly together. If Mr. Yoshida is looking down at the plant right now, he would say "I told you so..." over the water problems the plant has had one after another since April this year. On August 22, 2013, TEPCO sent out workers to do the inspection of the 1,000-tonne steel tanks that holds waste water after the RO (reverse osmosis) desalination treatment. The workers did not find any new leaks or signs of past leaks in the H4 area (where the tank No.5 was found with the water level 3.4 meters lower than it should be), but they did find two spots with high beta+gamma radiation levels. There was no sign of leak on those spots, and the water on the concrete floor turned out to be rainwater (nothing beyond background radiation). There are over 300 tanks of the same construction. The concrete platforms on which the tanks are placed look like they were simply poured to 200 millimeter (20 centimeter) thickness. No information whether the soil below the concrete had been amended. The entire tank areas are on a hill, overlooking the reactor buildings, for those who fear the next tsunami would wipe them out. #Fukushima I Nuke Plant: Leak of "300 Tonnes" of RO Waste Water May Not Be "300 Tonnes"
As I wrote in my previous post, TEPCO said at least 300 tonnes of highly contaminated (mostly beta nuclides) waste water after the RO (reverse osmosis) treatment may have leaked, because the water level of the tank that leaked was found to have dropped by 3.4 meters. Thanks to mostly TEPCO's extremely sloppy management of these steel tanks that hold highly contaminated RO waste water, it turns out we really don't know how many tonnes of this waste water has leaked from the tank No.5 in the area H4. It could be more, it could be less, but no one really knows. 1. Is it really "300 tonnes" leak? "300 tonnes" of RO waste water leak assumes the tank No.5 had been actually close to full (about 96% of the capacity) before the leak started. But this turned out to be just an "assumption" (sound familiar?) on the part of TEPCO. When the waste water is transported from the Reverse Osmosis Apparatus, it is fed to the tanks No. 5, 7, 8, 9, 10 evenly, because the tanks are connected to each other via the feed line. So when the tank No.7 becomes full, all the other tanks are assumed to be also full. 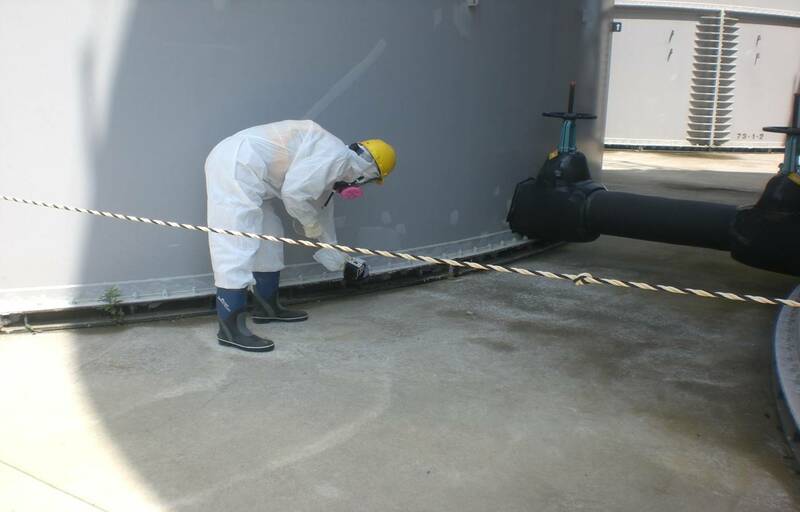 TEPCO had never measured the water level of the tank No.5 until this leak was found, and the company had to send workers on top the tank to stick in the tape measure. Mr. Kinjo from the Nuclear Regulatory Agency (secretariat of NRA) asked if TEPCO had confirmed that the tank No.5 had been full. The answer was no. 2. Where has this "300 tonnes" (if it was actually 300 tonnes) of waste water been leaking from? "300 tonnes" of RO waste water was supposed have leaked over a month, according to the media report. However, that's 10 tonnes, or 10,000 liters a day. Even for TEPCO, the amount is too large not to have spotted it much sooner. Workers who are sent out daily to patrol the site have been spotting leaks with few hundred liters. TEPCO says the workers didn't find anything until August 19. TEPCO hasn't found any leak from the visible part of the tank itself, but the level of waste water in the tank continues to decrease, albeit at rates that are not consistent with the constant leak. From 9:30AM to 3:30PM, the water level dropped by 5 centimeters. In the next 6 hours, it dropped by 1 centimeter. So in 12 hours it dropped by 6 centimeters, which translates into 10 tonnes in 24 hours. Could the concrete platform have cracks through which the waste water has been leaking? TEPCO couldn't answer, as there is no way to check the leak at the bottom of the tank unless the water is first emptied. 3. Has the water leaked into the open water? TEPCO says they have found locations along the drain that have high radiation levels, and says the possibility cannot be denied. However, the analysis of seawater on August 20 near the location where the C drain drains to the ocean shows cesium-137 at 0.0018 Bq/cm3, cesium-134 and all-beta were ND. If the waste water has been leaking into the ocean, the measurement at this location should show the high level of all-beta. It hasn't, so far, this time. So, in conclusion, neither TEPCO nor NRA know exactly what's happening, and but at this point it is more likely than not that this waste water with high beta hasn't leaked much into the ocean, at least not through the drains located nearby. There is a possibility that the tank No.5 wasn't full, and that it wasn't 300 tonnes that leaked. And there is a possibility that the leak is from the bottom of the tank, and it has been leaking through a crack in the concrete (if there's a crack). In case of the latter, radioactive materials, especially all-beta, will show up in the groundwater sooner or later if TEPCO monitors the wells for the groundwater bypass plan. TEPCO has finished emptying the tank No.5, but the radiation level inside the tank is just too high right now for closer inspection, according to NHK. But the facts (or I should say the lack thereof) don't matter much any more to most people, and the Japanese media (like NHK) is almost gleeful that the attention of foreign media like BBC, Reuters, Wall Street Journal, etc. is again on the plant. The most recent entity to weigh in is IAEA, saying it "views this matter seriously and remains ready to provide assistance on request." I just posted the article that the head of Fukushima's fisheries associations has agreed to the government/TEPCO plan of "groundwater bypass". However, there are two problems. So far, the water in the drains have little radioactive materials, and no radioactive materials have been detected in the seawater in the south of the plant, according to the Nuclear Regulatory Authority in the August 21, 2013 meeting. The second, and far more serious problem, I think, is that the location of the H4 area with at least one leaky tank is JUST TOO CLOSE to the 12 wells that TEPCO has dug for the groundwater bypass plan, to intercept and draw uncontaminated groundwater before it hits the reactor buildings. As the world's mainstream media and alternative media suddenly rediscover Fukushima I Nuke Plant over the "assumption" by a career bureaucrat at Ministry of Economy, Trade and Industry (whose Agency of Natural Resources and Energy oversees the decommissioning of the plant) that "300 tonnes of highly contaminated [sic] water" may be leaking every day, a real leak of actual waste water with extremely high beta nuclides has been found. According to TEPCO, who held an ad hoc press conference at noon on August 20, 2013, at least 300 tonnes of waste water after the cesium absorption (by SARRY) and desalination (by Reverse Osmosis Apparatus) has leaked from a huge 1,000-tonne steel tank (or two, they don't know yet), and it is likely that the waste water is STILL LEAKING as TEPCO hasn't been able to identify the location of the leak(s). Leak from a group of 1,000-tonne steel tanks (tank is 12 meters in diameter, 11-meter high) in the area H4 which has total 26 tanks. The location is about 500 meters from the embankment. One of the tanks in this particular group (No.5 in the group I in H4 area, or H4-I-5) was found with the water level that was 3.4-meter lower than before. Most of the leaked waste water went outside the low enclosure built around the tanks. The valve is installed to drain rainwater from the enclosure, and this valve was found "open", as it shouldn't have been. The water leaked inside the enclosure has been collected (about 4 tonnes as of 12AM on August 20, 2013). The area is being inspected every three hours, but the leak CONTINUES (or TEPCO cannot confirm that the leak has stopped, though the company seems to think it has stopped). TEPCO hopes to empty the tank No.5 and move the RO waste water into the tanks in the nearby group B, as the tanks in group B is only about 60% full. The rest of the tank in this H4 areas are 97.8% full. The scale of the leak is one of the largest since the start of the accident (excluding the April 2011 leak of highly contaminated water from the Reactor 2 turbine building basement). The manufacturer's warranty of the tank is 5 years. There is a drain nearby that goes to the ocean, but hardly any radioactive materials have been detected from the water (most likely rainwater) in the drain. (UPDATE 2) New post with a bit more information. (UPDATE) NHK News says the mist generator was not in use this time. It happened again. According to TEPCO's email alert for the press on August 19, 2013, an alarm sounded from the dust monitoring system in front of the Anti-Seismic Building at 10:04AM. This time, two workers waiting for bus in front of the Anti-Seismic Building were later found with 13 Bq/cm2 contamination on their heads. The dust monitoring result shows cesium-134 at 2.6×10^-4［Bq/cm3］ (0.00026 Bq/cm3), and cesium-137 at 5.8×10^-4［Bq/cm3］ (0.00058 Bq/cm3). When it happened the first time on August 12, 2013, the water used in the mist generator was first suspected, but it turned out to be not the case. There is no information whether the mist generator was in use this time or not. I finally managed to download the video properly from TEPCO's Photos and Videos Library page. For more about TEPCO's latest attempts to probe the Reactor 2 CV, see my posts, here and here. By the way, I happened to watch a BBC news clip August 6, 2013 on Fukushima I Nuke Plant, and saw in amusement the snippet of the video inside the Reactor 2 Containment Vessel (the one I posted on my August 4, 2013 post). The snippet was used while the announcer was saying "It [groundwater]'s now so high the water will soon reach the surface. Then it will start flowing overground into the sea." Some ask, "Why didn't Japan surrender after Hiroshima, or sooner?" Japan had been suing for peace at least since May 1945, sending secret delegations to contact the Allied Forces. The sticking point did seem to be about the status of the Emperor, but by July the surrender completely in the Allied Forces' terms - unconditional surrender - was being considered as the only alternative. Japan had nothing to fight with, and was defenseless. There were only a handful of major cities (Kyoto, Niigata, Hiroshima, Kokura, Nagasaki) that hadn't been bombed and incinerated. But the negotiations dragged on, going nowhere. Atomic bombing of Nagasaki has an added irony, as the bomb made by a Christian country destroyed a Catholic church with worshipers in it in a city where the Christians endured harsh state persecution for centuries and kept their faith. Here's Part 2 of the 2011 NHK documentary "Atomic bombing - top secret information that was never utilized (原爆投下　活かされなかった極秘情報)". I am aware that this part is even longer than Part 1, but I hope you have time to read it. August 6, 1945. The Imperial Army's special intelligence unit picked up the call sign in V600s at 3AM - one of the "special task planes". It was accompanied by a short-wave message to Washington, then followed by a wireless voice communication to the base in Saipan: "Approaching the target". Major Eizo Hori (see Part 1), head of the Division 2 of the General Staff Office that oversees the special intelligence unit, reported to his superiors that the weather reconnaissance plane was followed by the "special task plane" coming to Hiroshima. The General Staff Office sat on the information and did not share it with the regional headquarter in Hiroshima. The bomb was detonated 5 hours later at 8:15AM over unsuspecting residents of Hiroshima. There was no air raid siren. "Enola Gay" and the accompanying B29s were uncontested all the way to the target. Three days later on August 9, again 5 hours before the atomic bomb explosion over Nagasaki, the intelligence unit picked up the same call sign in V600 again, and this time the B29 was heading for Kyushu. In light of what had happened in Hiroshima, the information was again immediately delivered all the way to the head of the General Staff Office. The cabinet ministers [more than half of whom were either current or former high-ranking military officers] were in a meeting in the Imperial Palace to discuss what to do in light of the atomic bombing in Hiroshima that practically wiped out the city in an instant. They couldn't come to any conclusion, but the Chief of Staff Umezu assured them there would be no second atomic bombing. Meanwhile, a pilot of Shidenkai - Japanese fighter plane that could take out B29s - was waiting on the runway of a base in Kyushu. The sortie order never came. The group of B29s, including "Bockscar", on seeing the visibility of the first target of Kokura City in Fukuoka Prefecture was low, went on to the second target. The atomic bomb was dropped over a Catholic church in Nagasaki. Survivors, who were intimately involved in the atomic bombing of the two cities and were interviewed by NHK, are still left with the question, "Why didn't the government do anything?" August 6, 1945, 3AM. The Imperial Army special intelligence unit caught a call sign in V600s. The "special task plane" was heading toward Japan [for the first time]. Major Eizo Hori, of the General Staff Office, received the information. "We are approaching the target." That "special task plane" was B29 "Enola Gay", carrying the atomic bomb to be used in the real battlefield for the first time in human history. "They told us this was a big day, that we will be using, dropping our special bomb. Our target would be, in order, Hiroshima, Kokura, and Nagasaki. This is what we were trained for. Others were still training missions, but this was the real thing." "Enola Gay" departed Tinian Island, flew over Iojima, and headed toward Hiroshima. August 6. The regional headquarter of the Imperial Army at Hiroshima Castle had been on the heightened alert against air raids. Ms. Yoshie Oka, then 14-year-old student, was working at the headquarter running messages, as part of the student mobilization during the war. In the early hours of that day, neighboring cities had been attacked by large formations of B29 bombers - Nishinomiya [in Hyogo Prefecture], Imabari [Ehime Prefecture in Shikoku] and Ube [in Yamaguchi Prefecture]. The General Staff Office in Tokyo had had the information of the impending attacks in advance, so it had contacted the regional headquarters which then issued air raid alerts for the residents of those cities. The regional headquarter in Hiroshima was in the underground vault to escape air raids. The next target might be Hiroshima. Ms. Oka and others were there the whole night, so that they could issue air raid alerts as soon as possible. "Yes, we were tense, and unsettled. We were wondering what was going on that night. We stayed up all night, till the morning of August 6." Slightly past 7AM, a solitary B29 entered Hiroshima, about one hour before the atomic bomb was to be dropped. "About 7:20AM, there was a plane coming from Bungo Channel into Hiroshima. It was a B29. Judging by the radio wave it emitted, it was a weather reconnaissance plane." Major Hori's analysis was correct. According to the mission order issued by the US government, it was a weather reconnaissance plane. The instruction was that the weather aircraft fly first, and using the call sign of "V675" instruct the "Enola Gay", which was following the weather aircraft. "Then, as it flew over Hiroshima, this B29 emitted short-wave signal, again it was in V600s. This was so out of the ordinary, we thought. We knew the "special task plane" was approaching." However, the General Staff Office in Tokyo did not share this information with the regional headquarter in Hiroshima. Not knowing the "special task plane" was following the weather reconnaissance plane, the regional headquarter called off the alert. "That plane flew over us without doing anything, and we were all relieved. The commander and his staff stayed up all night, so they thought it should be OK if they went back home, eat something and take a short 30-minute nap and come back." "...none of our planes were ever shot at. Never saw a flight.. Prior to getting to Hiroshima, I did get out of my seat and I did stand behind the bombardier and the pilot. So I did have a look straight at the front of the plane." Why didn't the top military officials give the information of the "special task plane" to the Hiroshima regional headquarter? We still don't know the answer. Mr. Ryoji Hasegawa, who worked in the special intelligence unit, saw in this very room his superior mortified because the information they conveyed to the top officials hadn't been used. "His face said everything - 'My opinion was not accepted. I am so frustrated.'" "'Japan was being attacked, to death probably, and yet people are too slow to respond.' My superior's recognition was not shared with the other members of the General Staff Office." Ms. Yoshie Oka again. She was working as a student at the regional headquarter. Although she was only 700 meters away from the hypocenter, she was unharmed because she was in the underground vault. But her 60 classmates who were out in the nearby field all perished. If only there had been an air raid alert. Ms. Oka is chagrined even today. "We were working in this underground vault, and we were saved, with no injuries. If there had been an early air raid alert and people had taken shelters in the underground vaults, many people wouldn't have had to die, many more people would have survived." Ms. Oka tended her injured classmates after the bomb dropped. But all she could do was to watch them die, one after another. "A mother was holding her badly injured daughter and cried. But the daughter said, 'Don't cry, mother. I am dying, serving the country.' And she made a smile on her badly burned face and died peacefully. Every day was like that. It was hard. All we could do was to watch." August 7, the day after the bombing of Hiroshima. Even after the news of destruction of Hiroshima reached them, the Imperial Army wouldn't admit it was an atomic bomb. "The US is saying it was an atomic bomb, but it is also possible that it was just a conventional bomb with large explosive power." Minister Togo said the Army, who denied the existence of an atomic bomb, was trying to minimize the effect of the bomb as little as possible. However, the General Staff Office admitted, among themselves, that it was an atomic bomb that was dropped on Hiroshima. On August 8, two days after the bomb was dropped, an award ceremony was performed by the General Staff Office in the courtyard of the headquarter of the special intelligence unit. The feat of identifying the call sign of the B29 that dropped the atomic bomb was hailed as great achievement. We found someone who was present at the ceremony. Mr. Kunio Tanaka, 90, was a captain of the special intelligence unit. Mr. Tanaka listened to the officer from the General Staff Office explaining that the B29 with the call sign in V600s was carrying an atomic bomb. "'The plane was carrying the most terrible weapon, atomic bomb. If the same kind of planes come again, we will stop them. We will pursue and destroy them. You all did a great job.' We received the praise from him." However, the very next day, the same tragedy was repeated in Nagasaki. Before dawn on August 9. The same call sign came in - V675, exactly the same as in Hiroshima. It was coming from Tinian Island, just like before. We found someone who was monitoring this very call sign. Mr. Arao Ota, 90, was a lieutenant in the intelligence unit. He spoke about the day for the first time on camera. "It was the same special radio wave used by the B29 that dropped the atomic bomb on Hiroshima. It was coming from the airfield on Tinian Island. We didn't know what it said, all we knew was the radio wave was emitted. But it was me who caught the call sign. I knew it was out of the ordinary, I felt fear. I thought there was a high probability that within a few hours an atomic bomb would be dropped somewhere in Japan." This information did reach the top officers in the military. We found the document that backs it up, at the Military History Department of the Ministry of Defense. It was Lieutenant Colonel Tadao Inoue of the General Staff Office who left the document. He was a close advisor to Chief of General Staff Yoshijiro Umezu. "Special bomb V675. We knew in advance, via communication [radio wave], 5 hours before Nagasaki was bombed." So, the information of the bomber with atomic bomb approaching had indeed reached the top of the General Staff Office 5 hours before the bombing. Omura Airbase, 15 kilometers north of Nagasaki. In order to protect the entire Kyushu, a detachment of fighter planes was stationed in the airbase. Mr. Minoru Honda, 88, was a pilot there. Mr. Honda and his fellow pilots flew "Shidenkai" (Purple Thunder). Shidenkai was one of the few fighter planes that could go as high as B29, to 10,000 meters. Mr. Honda says he was determined to take out B29 with the atomic bomb if it came again, even if that meant a suicide attack. Mr. Honda happened to witness the atomic bomb explosion in Hiroshima from the sky two days earlier. He was on his way from Hyogo to his base in Omura. "Just as I was flying over the Hiroshima Castle, I was blown off the course. The heavy Shidenkay was blown off. The plane became uncontrollable, and I must have dropped at least 500 meters. I finally regained control of the plane, and looked up ahead. Then I saw a cloud of red and black rapidly rising. The city of Hiroshima, which I had just looked on moments ago, disappeared. I couldn't see the city. I thought I had gone crazy. I couldn't tell if that was real." August 9, 9AM. After taking off Tinian, the B29 with the second atomic bomb was approaching Kyushu - "Bockscar". It went first to Kokura City in Fukuoka Prefecture, but since the visibility was bad it moved on to the second target, Nagasaki. However, no order came to Mr. Honda's unit to make a sortie. That B29 was approaching Nagasaki was confirmed, but they weren't told the B29 was carrying an atomic bomb. "B29 is not impregnable. I actually shot it down. It is extremely difficult, but it's not impossible to shoot it down. Even today, I am vexed. Why didn't they issue us a sortie order? They lacked information that much?" August 9, 10:30AM. The Conference of Supreme Leaders of War was on-going at the Imperial Palace all morning. They had received information of further deterioration of the war. On August 9, 1945, Soviet Union, which had remained neutral, declared war against Japan, and the troops were crossing the Manchurian border. The topic of the meeting that day was whether to accept the Potsdam Declaration and make an unconditional surrender. But if they surrendered, what would happen to the status of the Emperor? Would they be harshly prosecuted as war criminals? They couldn't decide what to do. Umezu: "It is true that the damage from the atomic bomb is extremely heavy, but I doubt that the US can keep using the bombs one after another." At 11:02AM, while the meeting was still on-going, an atomic bomb was dropped on Nagasaki. Again, there wasn't even an air raid siren. Mr. Arao Ota, who caught the call sign from Tinian Island and reported on the danger of the second atomic bombing, still can't understand. "I am so mortified. We knew it! If they used the information and did all they could, then we might have been able to accept it. But there was no indication that they used the information. All the more I'm mortified." "The same call sign was caught again on August 9, but nothing was done. A day after the fair." Mr. Minoru Honda, who was waiting for a sortie order at Omura Airbase, was ordered to carry injured people to the hospitals after the bombing. "I can't forget, till I die. People without any hair, naked with no clothes on, melted. How could a horrendous thing like this be allowed in this world? I cried and cried. I didn't even know why I was crying. I still remember. I feel helpless. As a soldier, I feel helpless, I feel sorry." We shared our new information with Mr. Honda, that the top military officers had information of the bomber with the atomic bomb approaching Nagasaki 5 hours in advance. The truth, the first time in 66 years. "So they knew. Then why didn't they issue orders? 5 hours were more than enough to thoroughly prepare." "So this is Japan. Such a thing, I think it will happen again, if we let them get away with it." On August 11, with Japan's surrender all but certain, an order was issued to the special intelligence unit - destroy all information, including intelligence information, kept at the headquarter in Tokyo. "I was told to burn them, and then turn them into dust. Destroy evidence. Destroy evidence of the existence of the unit." Mr. Hasegawa says he kept burning the documents there, until the day of surrender. Everything, including the fact that the Imperial Army knew about the activities surrounding the atomic bombing, was made to cease to exist. Hiroshima and Nagasaki. Atomic bombs dropped on defenseless people. Many lives and living were destroyed in an instant. Knowing the grave danger approaching, the military leaders did not share the information. Two tragedies keep asking us about the responsibility of those who lead the nation. This is beyond incompetence. They purposefully withheld the key information and lied. NHK does not speculate why the top military (essentially the government) decided to sit on the information, but the documentary seems almost begging us to "read between the lines" when the scene was described with highest ranking officers and government officials meeting to decide what to do on the day of Nagasaki bombing. Excuse can be made for the Imperial Army that by that time, having tens of thousands of people killed on one bombing raid must have seemed like nothing. In March that year, more than 100,000 people perished in Tokyo in one night in a massive incendiary bombing. Hundreds of B29 had been dropping bombs indiscriminately over cities. A few B29s flying toward Hiroshima may have hardly seemed worthy of any attention, even though they were with the peculiar call signs and did unusual things (like short-wave communication to Washington). But all they needed to do might have been to sound an air raid siren so that people would stay in bomb shelters, and to send fighter planes to at least harass the B29s so that the B29s would abandon the missions (and drop the charge in the ocean, instead of over the targets). Instead, they withheld, lied. The B29s were uncontested. It is almost as if the military wanted the bombs to go off. The documentary was aired two years ago. Since then, arm-chair general (or I should say cosplay tank commander) Shinzo Abe has become the prime minister for the second time. Despite the revelation from, of all people, NHK, most Japanese don't seem to care that ordinary Japanese in Hiroshima and Nagasaki were essentially abandoned by the central government in August 1945. From what I can tell, this documentary doesn't seem to have caused much impact in Japan at all. The Japanese continue to let them get away with it. It is an inconvenient truth, which doesn't suit anyone's narrative. The Japanese government wouldn't want to admit to any of this, after 68 years of having gotten away with it. Japanese people who condemn senseless killing of civilians by the US using atomic bombs would want to keep their narrative that the attacks were "surprise attacks" by the US. They have to remain the victims of the atomic bombs dropped by the US. They probably wouldn't want to admit that they were victims of their own government. Mr. Honda the Shidenkai pilot said it will be repeated if people let them get away with it. Many would say it has been repeated, most recently on March 11, 2011 and its aftermath. It will be repeated. P.S. Chief of Staff Yoshijiro Umezu received a sentence of life in prison in the International Military Tribunal for the Far East, but died while in prison in 1949 because of colon cancer. If he lived, I have no doubt that he was pardoned, like most others who also received the life sentence. He is enshrined in Yasukuni Shrine.